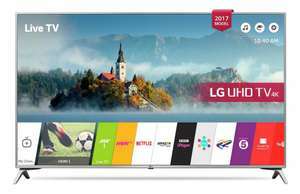 The slim design of the LG 55UJ651V Smart TV, paired with the latest Ultra HD innovation and HDR picture technology, means that it looks good from every angle. HDR gives you incredibly clear blacks and natural contrast, for a true-to-life picture. With 4K upscaling you'll get the best experience from all your content. To match the stunning picture quality, you'll also enjoy multi-channel ultra-surround sound from seven virtual channels. For entertainment, look no further than the built in, award winning Smart TV webOS. Connect quickly to Netflix 4K HDR content or catch-up on TV with Freeview Play. Easily plug in any extras with 4 HDMI and 2 USB ports. LED TV Screen.4K Ultra HD display resolution.Screen size: 55 inches.Hz.Viewing angle 178/178 degrees.Resolution 3840 x 2160 pixels. 2 USB ports and 4 HDMI sockets.Smart TV.Component video socket.Composite socket.Optical connection.Wi-Fi enabled.Ethernet connection.DLNA compatibility.Miracast.Open browser.Suitable for wall mounting 300 x 300 bracket. Features USB video playback.Micro dimming technology improves the contrast by dimming individual sections of the TV screen.Freeview Play digital tuner.Saorview digital tuner (Saorview can only be received in the Republic of Ireland).Quad core processor. Sleep timer.Parental controls.Size of TV H71.8, W123.7, D6.4cm.Weight of TV 16kg (unpackaged).Size of TV with stand: H77.8, W123.7, D23.3cm.Footprint of TV 1191cm.Weight of TV with stand: 16.2kg. Energy efficiency rating: a+.Energy efficiency index (EEI) 0.21.On mode power consumption 85 watts.Annual power consumption 118kWh.Standby power consumption 0.3 watt.This product contains lead. 10 bit police having a day off?! I picked up the model up from this and am trying to return it in Currys. Viewing angles and Colour calibration are absolutely awful. Make sure you view all content types before you buy. why not just spend an extra £1000 and buy an OLED TV? I picked up the model up from this and am trying to return it in Currys. …I picked up the model up from this and am trying to return it in Currys. Viewing angles and Colour calibration are absolutely awful. Make sure you view all content types before you buy. Currys don't seem to sell this model? Looks like an Argos exclusive? As I said I picked up the model up from this. UJ701V or something like that. As I said I picked up the model up from this. UJ701V or something like …As I said I picked up the model up from this. UJ701V or something like that. It is ..but I picked up the more expensive model and it's terrible. So I'd warn people off buying an LG tv until they see it action. Lookin at possibly getting a 55UJ750V for the bedroom later today, will be able to grab it for £528 if we do but I really am not a fan of Lucky Goldstar, always had hang ups about them for many reasons spanning many years. Not really coming up with any credible reviews when I search it either, anyone on here know that model? Could you please share the deal for the tv? ?